Converts OST files to MBOX without considering it's mode of formation. The OST Data to Mailbox Converter software helps you to convert multiple emails from the entire folders of an OST file into MBOX format keeping attachments embedded in mails. It is possible to convert emails from inbox, outbox, drafts, sent items, etc. into the MBOX file format by retaining complete Meta data. Also, the software will maintain the folder hierarchy while saving OST as MBOX. As you open the OST file, the software will perform it's quick scanning. This will help users to reindex the data from a corrupt, inaccessible or orphan OST file. All the items and folders present within the OST file will get scanned and listed in its original folder structure. The scanned result will get automatically saved and to open or scan another file you will need to close the previous one. Once the scanning finishes, the software will generate the instant preview of all the emails present within the OST file. It is possible to view all the details associated with each items like: To & from email address, subject of mail, date, contact name, fax number, contact number etc. The software ensures to keep these Meta properties intact after Outlook Email OST file to MBOX conversion. By default, the Outlook OST data file to MBOX converter allows you to migrate all the item folders from OST into MBOX. But, if required, you can check or uncheck the items to save only selective item folder. The software will create an MBOX file for each item folder having emails e.g. inbox.mbox, sent-items.mbox, drafts.mbox and so on. Since Mozilla Thunderbird is a globally used MBOX supporting email client, many users will be having the need to convert OST to Thunderbird format. This tool allows the users to import OST file to Thunderbird MBOX format easily and efficiently. Note: Export the resultant MBOX files to Thunderbird using Thunderbird Import Software, which can be obtained free of cost along with OST data to MBOX Converter. As you click on the button to export OST files to MBOX, the software will ask you to provide a file saving location on your machine. You can select any desirable location or if required you can create a new folder from software panel itself to save the file. Once you provide the saving location, the software will begin the conversion. MBOX files are being used by a number of emailing applications like Eudora, Entourage, Apple Mail, Mac Mail, Sea monkey etc. Each of these applications allows you to import MBOX files from an external source. Thus, once you export OST email file to MBOX, it will become easier for you to open an inaccessible or orphan OST file data. For Mac users, it is easier for them to use Apple Mail for accessing the MBOX files than using any other email clients. OST to MBOX Converter can convert OST files to Apple Mail MBOX format without data loss. Demo version of OST to MBOX Converter software allows the preview of inaccessible OST FIles. 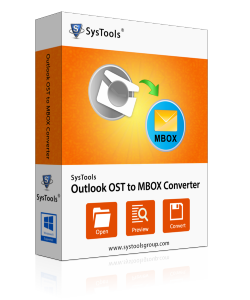 What all are the main qualities of SysTools Outlook to MBOX Converter that makes it dominating over other tools? Export OST Data file to MBOX using Windows 10 and all below versions. Export Outlook OST File without any file size limitation. Migrate Outlook email OST file in the absence of Exchange Server environment. Supports conversion of OST files created by all MS Outlook Versions. I want to use the tool to access my inaccessible OST to Thunderbird MBOX on my new Windows 10 machine. Can I? Yes, you can use the tool on Windows 10 machine. You can install the tool on any Windows machine version 10 or below & recover all OST file items into MBOX format. How to import Outlook OST File selectively to Eudora mail MBOX Files? You can move Outlook OST Data file selectively to MBOX using OST to Eudora Mail converter by checking or unchecking the items that you wish to import to the MBOX format. What is the file size limitation imposed by this tool? Inorder to import OST to Thunderbird MBOX, the tool doesnot impose any file size limitation. You can undoubtedly convert your large sized OST data to MBOX file format. Will the software allows the email meta properties to be kept intact even after the conversion? Yes, During OST file to Thunderbird migration, the Outlook email OST file metadata is being kept intact for the easiness of the user. Can I import OST to Apple Mail MBOX? Is it necessary to have any MBOX supportive email client on my machine to convert OST email file to MBOX? No, there is no need to have any MBOX supportive email clients such as Thunderbird, Eudora, Entourage or Poco Mail on the machine. Software will convert outlook OST to MBOX seamlessly. Is the resultant MBOX files created after the Conversion, compatible with Entourage account? "I have both Outlook and Entourage account. Now a days I am facing trouble accessing the OST files. I suspect it is because of OST file corruption. Is there any way to convert the OST files to my Entourage account without data loss." Yes, you can use this tool to migrate Outlook OST data to Entourage account. Since Entourage is one among the large number of email clients which supports MBOX files, there wont occur any compatibility issue also. How much time is required to move Outlook 2013 OST data file to Opera Mail? “I am having OST data of around 3GB with me. As I wish to start using an MBOX supporting Email client now, I need to convert it to MBOX format. Will it take too much time for converting into MBOX?”? No, it wont consume much time to convert the OST data files to MBOX since completion time depends only on the size of the OST file. Since you are having only 3 GB of data, it wont take much time as you think for the conversion to complete. Will the tool convert .ost formed as a reult of configuring Hotmail in MS Outlook? Is it possible to convert inaccessible OST files using this software? Yes, It is possible to convert healthy, corrupted as well as unusable (also called as inaccessible or orphan) OST files using the OST to Mailbox Converter. I searched and found SysTools Outlook OST to Thunderbird Converter for converting my OST Data file to MBOX format. I am so grateful to the entire team of SysTools for providing an application that takes care of the process that falls after license upgrade, which no one else does. Though the interface of Outlook OST data to MBOX migrator was quite friendly and didn't involve any complicating steps, at some point when I got stuck, contacting support team proved helpful. Hats off to the executive who patiently helped me out at each step without any delays. Thankful to the SysTools Group team. I have been searching for an efficient tool to convert my OST file to Thunderbird MBOX format. As per my colleague's suggestions, I used SysTools Outlook to MBOX Converter. The results were awesome. Kudos SysTools! I was really worried when I faced a sudden need to convert the complete OST data to MBOX format. I found OST to Mac Mail Converter from Google. Eventhough I was worried about the credibility of the tool, I used it and found surprising results. I am willing to suggest it to all without any hesitation.